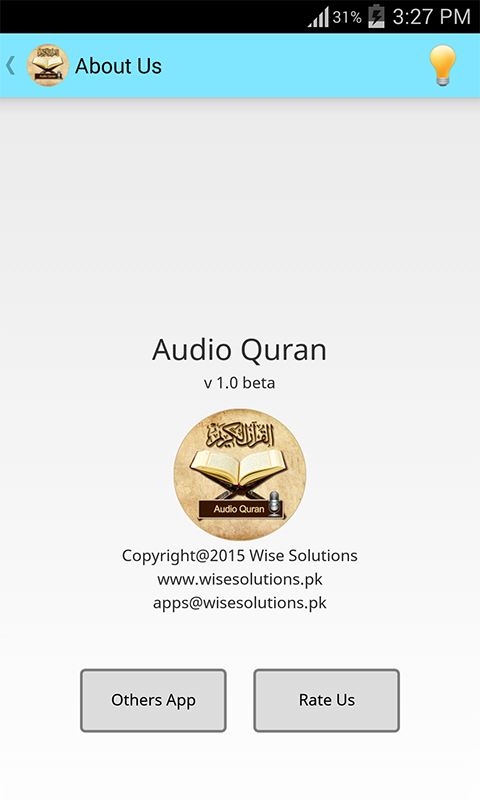 Audio Quran is an android application with audio recitation of multiple reciters. Features included in this application are - Audio recitation of from top reciters including Abdul Rehman Al Sudais, Saad Al Ghamdi, Ahmed Saud, Mishary Rashid Alafasy, Qari Abdul Basit, Qari Syed Sadaqat Ali and Sheikh Abbu Bakr Shatri. - Listen Quran online or download for listening offline. - Share any Quranic surah with your friends. Share and when ever your friend will listen, you will get equal reward from Allah S.W.T - Play audio in the background - Bookmark your favorite surahs - Auto pause on incoming or out going calls - Notifications - High quality audio Quran Bugs, errors, suggestions or feedback, email us at apps@wisesolutions.pk In future we are coming up with translations and more voices. Don't forget to rate this app.